Like the Velvet Underground decades earlier, the success of Zunior Independent Music Hall of Fame inductees Eric’s Trip has never been gauged by album and ticket sales, but rather by the number of bands, and the volume of art, inspired and influenced by the trailblazing Moncton quartet. Formed in the summer of 1990, Eric’s Trip comprised the principal members of Moncton punk band The Forrest (guitarists Rick White and Chris Thompson), drummer Ed Vaughan (replaced two years later by local music scene veteran Mark Gaudet) and charmingly shy budding songwriter Julie Doiron. The band took its name from track five of Sonic Youth’s influential 1988 LP Daydream Nation – an early indication of the group’s self-effacement and lack of pretension. Whether due to Moncton’s relative isolation, its anemic underground scene or the peerless style of the band’s music, Eric’s Trip didn’t make its live debut until April, 1991. 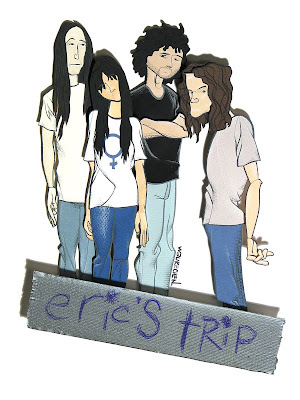 By that time, however, the group had already recorded and released a pair of cassette EPs (Eric’s Trip and Catapillars) and had another (Drowning) in the works. In classic DIY style, the tapes (composed on borrowed four-track recorders in band members’ family basements) featured gorgeous original artwork by the band, along with extensive and poetic liner notes. A fourth independent release, the Warm Girl EP, followed in January of ’92. Love Tara, the band’s first full-length release, was issued by Sub Pop in November of ’93. Given the album’s wide release, Love Tara represented an introduction for many listeners to what White described as, “sappy melodic pop music on top of thick distortion.” Most mainstream critics scratched their heads and bemoaned the album’s lo-fi qualities, while those same elements were enthusiastically celebrated by members of alternative-friendly media outlets. Thematically, much of Love Tara’s lyrical content was inspired by the end of White and Doiron’s romantic relationship. The resulting amalgam made for a highly original style presenting sonically heavy music with vulnerable, at times naively confessional lyrics, softly delivered by both male and female voices. Since first reuniting for a Canadian tour in 2001, Eric’s Trip has performed a handful of live shows including annual appearances at the Sappy Records Festival in Sackville, N.B., and a showcase at the 2007 Halifax Pop Explosion festival. A live CD called Eric’s Trip: Live In Concert, Nov. 4, 2001 was issued by White’s label Great Beyond Recordings in 2002. The members of Eric’s Trip have remained prolific and creative since the band’s original breakup and over the course of subsequent reformations. White has released several albums of psychedelic rock under the auspices of Elevator to Hell, Elevator Through and simply Elevator. He also has a number of solo discs to his credit, has performed and recorded as a member of The Unintended and has produced albums for various other artists including The Sadies, Orange Glass, Joel Plaskett and Julie Doiron. Doiron, meanwhile, has enjoyed considerable success as a solo artist, initially under the auspices of Broken Girl. In March 2000, the artist was bestowed a Juno Award for her work on the CD Julie Doiron and the Wooden Stars. Her many other collaborations include those with Shotgun & Jaybird, Phil Elverum, Calm Down It’s Monday and Okkervil River. Chris Thompson remains busy with his solo project Moon Socket, which he has been working on since prior to Eric’s Trip’s demise. Thompson’s other ongoing musical projects include Orange Glass and The Memories Attack. After several years collaborating with White in Elevator, Mark Gaudet has rekindled his old 1980s punk band, The Robins. A new album (produced by White) has been recorded and is awaiting release. Eric's Trip/Moviola split 45 (Eric's Trip: Pillow (Red) b/w Moviola: Pay Day/Don't Speak/The Horse) - 1996 - Metoo!